Defiance is the story of courage and survival in a place unlike any other you could imagine. Set in the wake of an alien conflict, a completely transformed planet Earth is inhabited by human and alien survivors forced to live and work together in the aftermath of this global catastrophe. Mysterious drifter Joshua Nolan (Grant Bowler - True Blood, Lost), a former military lieutenant and his lone companion, Irisa (Stephanie Leonidas - Whi..
As Defiance's second action-packed season begins, the lives of the townspeople remain in turmoil as Nolan (Grant Bowler) searches for Irisa (Stephanie Leonidas), Amanda (Julie Benz) deals with a personal loss and Stahma (Jaime Murray) plots to take over Datak's criminal empire. Meanwhile, Earth Republic's control of Defiance brings changes with far-reaching consequences, including a scheming new mayor (James Murray) whose secret agendas.. 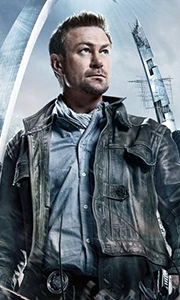 The second season of the US sci-fi drama that follows the attempts of Lawkeeper Joshua Nolan (Grant Bowler) to keep the peace in the futureworld frontier town of Defiance. Set in the near future, Earth's landscape has been decimated after years of war with the Votans, an alien race seeking a new home after their own star system was destroyed in a stellar collision. In this series, Nolan searches for his adopted alien daughter Irisa (Ste..
From the producers of Battlestar Galactica, Caprica and Farscape comes the third season of Defiance. Nolan and Irisa return to the ruins of Defiance seven months after the complete destruction of New York City. They find the town on the verge of war with the Votanis Collective, led by the notorious General Rahm Tak. To beat impossible odds and to save Defiance from the brutality of the Votanis Collective, the town turns to the mysteriou.. Season 1: Defiance is the story of courage and survival in a place unlike any other you could imagine. Set in the wake of an alien conflict, a completely transformed planet Earth is inhabited by human and alien survivors forced to live and work together in the aftermath of this global catastrophe. Mysterious drifter Joshua Nolan (Grant Bowler; True Blood, Lost), a former military lieutenant and his lone companion, Irisa (Stephanie Leoni.. Season One: Defiance is the story of courage and survival in a place unlike any other you could imagine. Set in the wake of an alien conflict, a completely transformed planet Earth is inhabited by human and alien survivors forced to live and work together in the aftermath of this global catastrophe. Mysterious drifter Joshua Nolan (Grant Bowler; True Blood, Lost), a former military lieutenant and his lone companion, Irisa (Stephanie Leo..
Own Defiance Seasons 1 to 3 Complete Collection DVD from Deff, DVD, Blu-Ray & 4K Video Specialists - Free UK Delivery..